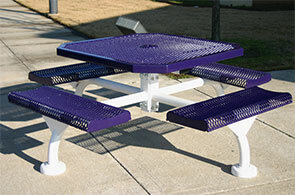 3/4" # 9 expanded rolled metal forms the top and seats on this uniquely designed octagonal commercial picnic table. Top and seats are finished in a slightly texture matte Polyethylene coating in the color options shown below. The powder-coated span style frame features four 2-7/8" arms extending from a durable center post to add strength to this attractive commercial picnic table. 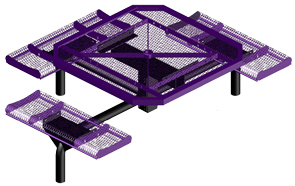 The in-ground models have an extra 30" of length on the frame legs to allow for permanent installations. Surface mount models have standard mounting plates that can be either bolted down to concrete/asphalt for surface mounting applications or left un-bolted for portable applications. For that final finished look, optional grout covers are available and powder-coated to match the span style frame color. Optional 7-1/2" and 8-1/2" umbrellas are available in any of the color options shown below, in either a single solid color or a 2-color alternating pattern. For extra stability and safety, a plastic/concrete Umbrella Stand can also be ordered.